Coconut oil has such fantastic health benefits that I’m always looking for more tasty ways to add it to our diets. 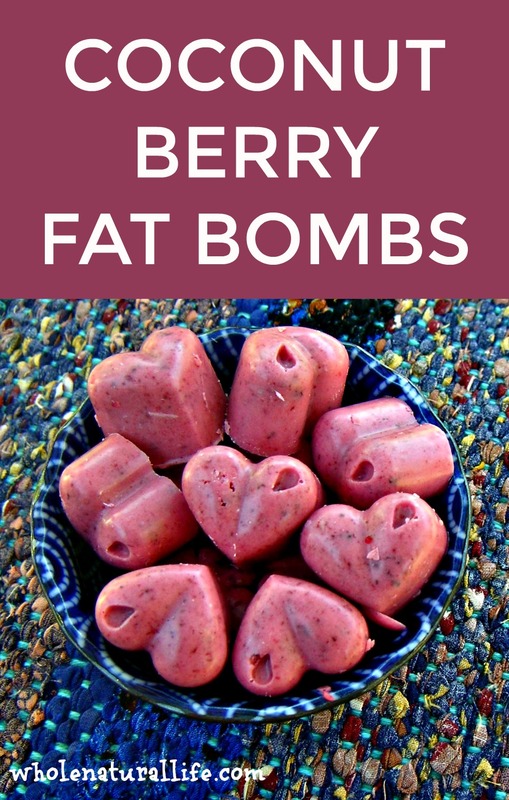 One of my favorite creations is these coconut berry fat bombs. They’re delicious! To me they taste sort of like melted berry ice cream: flavorful from the berries and creamy from the coconut oil. I’ve served these to several people, including some non-real food eaters, and everyone who’s tried them has loved them. I use refined coconut oil in this recipe. Although you may assume that refined oils are automatically bad for you, this is not the case when it comes to coconut oil. The benefits of coconut oil are mostly about the fat, and refined coconut oil has the same fatty acid composition as virgin coconut oil. While I do use virgin coconut oil in some of my recipes, I like using refined coconut here because refined coconut oil does not taste like coconut, and I personally don’t care for the strong taste of coconut unless it’s countered by an equally strong flavor such as chocolate or mint. If you do want your delights to taste coconutty, however, feel free to use virgin coconut oil instead of refined. One more note about coconut oil: not all refined coconut oils are the same. Make sure you buy a high-quality coconut oil that doesn’t use chemicals during the extraction process. I personally purchase this brand through my food co-op. For the berries, I used a frozen “antioxidant blend” from Costco that includes raspberries, pomegranates, blueberries, cherries, and a few strawberries (because that’s what I had on hand). I think any other mix of flavorful berries would also work. If you can get fresh berries, I’m sure those would work just as well as frozen—I just pretty much only buy frozen berries because fresh organic berries are so expensive here in Colorado. A reader mentioned that she had trouble with her berries being too cold to mix with the melted coconut oil. If you’re concerned that your berries may be really frozen, you can leave them out for a while to defrost first, or heat them gently on your stovetop before trying to mix them with the coconut oil. Food processor: You can make this recipe in a blender, but I find that it’s much easier to use a food processor because the clean-up is easier. I use this food processor. Silicone chocolate molds: For optimal aesthetics, I recommend using silicone chocolate molds. Here are the molds I used in the photo above. More recently I purchased this set of molds, which is more economical but just as high-quality, as far as I can tell. If you really get into making your own coconut oil bites, I highly recommend owning a small collection of silicone molds–they make the process very easy, plus they’re cute! 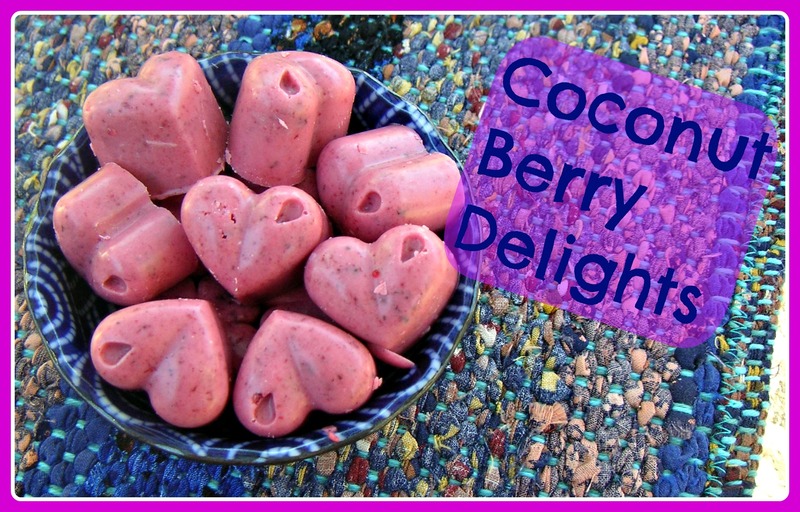 Coconut Berry Delights: A Tasty Way to Eat More Coconut Oil! Add the vanilla extract and stevia to your food processor. Pour the melted coconut oil into your food processor and process to mix with the fruit and other ingredients. Continue mixing until all of the fruit is smoothly blended into the oil. The mixture should now be a thick blended consistency. If for some reason your mixture is still frozen and not blending properly, you can remove some of the frozen bits and gently melt them on your stove. Once melted, return the mixture to your food processor and try again to mix everything together smoothly. Scoop finished mixture into molds or simply drop spoonfuls on a parchment paper-lined surface such as a cutting board. Using the molds will make your coconut berry delights prettier, but simply dropping them as spoonfuls works just as well if you don’t have or don't want to use molds. Put molds or parchment paper-lined surface into the freezer to firm up the delights. After half an hour or so, or whenever they have become solid, remove from the molds/parchment paper and store in a container in your freezer. Enjoy whenever you feel like you need (or want!) some coconut oil. I wouldn’t eat more than one or two of these at once (at least starting out), as eating too much coconut oil all at once can cause intestinal upset. (Something I’ve experienced firsthand.) How much is too much seems to vary from person to person, so I recommend experimenting gradually if you don’t yet know your own tolerance level. If you want more ways to get more coconut oil into your diet, you should check out my other coconut oil-rich recipes, like lemon coconut fat bombs, homemade coconut oil mint chocolate, and coconut oil fudge. Super cool! Going to definitely try this. Thanks for the creativity! These are great! I took this recipe and the one for chocolate mints, left the mint out, and made double layered lollipops - chocolate and berry - so delicious!! Thank you! I'm so glad you liked them, Kelly! And what a great idea to make chocolate and berry lollipops! Wow, these sound delicious! I can't wait to give these a try. Mmmm I am definitely going to try these... and I would probably eat all fo them at once if you didn't just warn me of the digestive issues....mmmm. Thanks for sharing on Natural Living Monday! I am excited to see what you have to share this week. I don't know, I think you'd have a hard time eating them all at once--I think coconut oil is very filling! Yes. Just yes. Love these, Meghan! Made these last week... they rock!! I'm always trying to eat more coconut oil. I've been eating one as soon as I wake up each morning, to tide me over till I make breakfast. Thanks for sharing this recipe, Lauren. Have made both this (see my post below for my variation) and your lemon coconut delights. So much easier to eat coconut oil this way. I finally made these and was shocked at how great they are. After making coconut oil chocolate mints with stevia and not loving the aftertaste of it I did honey. Also used trader joes organic berry blend and unrefined oil. Mine got really thick as I was pouring it into molds and I had to d the rest by dropping spoonfuls. Maybe the cold berries thickened it that fast. My 2 year old ate two and is begging for more. You just made my day, Katie! Thanks for coming back and telling me how much you liked them. These look outstanding! Just one question before I head into the kitchen to make them...how many treats does one batch yield? Wondering if a blender would work for those of us who don't have a food processor? Yes, Susan, I do think a blender would work. You might have to make your mixture more liquidy to get it to blend properly, so I'd try melting a larger portion of the coconut oil. You'd probably also need to use molds or ice cube trays, rather than dropping spoonfuls onto a flat surface. I hope they turn out well for you! Thanks Meghan, looking forward to trying them soon! I have powdered Stevia. So how much would I use instead of the liquid? Thanks! I can't wait to try these! Lynda, there's really no standard sweetness level for stevia so I'm afraid I can't advise. However, this recipe is very friendly to tasting as you go, so I'd recommend just adding a very small amount and then seeing if it's sweet enough for you. YOu can easily add more as necessary. Okie doke, thanks. Here's to tasting! Hi, there -- I'm doing a Whole 30, which eliminates even natural sweeteners. Have you tried these without the honey or stevia? I suppose without sweeteners the berry and coconut flavors would be preeminent. I have not tried these without honey or stevia. I think they would be somewhat bland without the added sweetener, but maybe adding some other strong flavor to compensate? Thank you for this recipe! I hate the taste of coconut oil, but loved these! So easy to make. I made half the batch to try out first and they were delicious. I used fresh strawberries and loved it. My 13 year old son loved them too but I didn't tell him it was coconut oil just a new dessert. I'm glad you said eat only one or two to start with. I think we could have eaten the whole batch! I can't wait to try the mint chocolate. I'm glad you liked them, Vickie! If you really don't like coconut, you may also want to try making the mint chocolates with the refined coconut oil, so they don't have that coconut taste. I hope they turn out well for you, too! I made these with the refined coconut oil, strawberries and blueberries. it froze up into frozen ice cream in my food processor. So I used my scoop to try to scoop it out and then mold it into balls, sort of. Would this work to use less frozen fruit, or does it need to be frozen? My 10 yo liked it, but said it was TOO creamy. :) I think I might try to use a little more fruit to make it not as rich. I want to try half virgin oil and half refined too. I told him it was ice cream 'balls'. They keep very nicely in a container in the freezer. Amy, if you look at the directions again, you'll see that I recommend heating up some of the mixture if it's too frozen to process in your food processor. I end up doing this a lot, since it all really depends on how warm/cold your various ingredients are and it's hard to get the balance right on the first try. I'm glad you liked them even with the issues, though! My 2 year old son and I made these together today (a great recipe to make with kids, btw!) and to my surprise, he LOVED them! I suppose I shouldn't be surprised because he is a good eater, but he wanted more and more and I had to cut him off! What a fantastic way to get him to eat his coconut oil! I make healthy fudge with coconut oil but this is awesome because he can eat it at night without staying awake from the chocolate! Thank you so much for these. Do you have a trick for keeping the berry mixture and oil together? Mine tended to seperate. We don't mind, but they look prettier in your picture! Sara, I have had that separation happen to me a couple of times. I'm not totally sure what causes it, but my theory is that it happens when your mixture is liquid (rather than somewhat frozen). I think when everything stays more solid, the oil tends to stay emulsified rather than separating out. Also letting them sit out for a while before putting them in the freezer also seems to encourage separation. But in any case, I'm glad you guys both liked them! Just tried these and frozen berried solidified the oil immediately, melted half and tried remixing, still didn't mix well but taste good anyway. Next time I will make sure that the berries are at least half thawed. Yes, it's hard to get the ratio of melted to solid ingredients just right to optimize mixing. I'm glad they still tasted good, though! Hi - just wondering if you are using 8oz of the melted coconut oil, or are using a dry 1 cup measurement for the solid coconut oil? Thanks - they look great! I'm using a dry one cup measurement. I just pack the coconut oil into the cup until it's full. How much honey do I use to replace the stevia? thank you for the great recipe! Malanie, I have not tried replacing it with honey myself so I can't say for sure. But it is very easy to just add a little bit at a time, taste, and then add more if necessary until it tastes good to you. I hope it turns out well for you! I found this recipe last night and was extremely excited to try it (and the chocolate cups one... but I dont have cocoa powder and need to run to the store for that. But I have all the ingredients for the berry bites. lol) first thing this morning. My question is this... do you really use 1 cup oil to 1/2 cup berries? I found that that ratio made for berry tinted oil bites. I ended up using four cups of berries to the one cup of oil and even then I'm not sure the mixture will be berry'ie enough. When I offered my husband a taster his only comment was "That's very oily" Did I miss something in translation? Mae--no, you read the recipe right. The reason that the oil to berry ratio is so high is because I came up with this recipe for the sole purpose of getting more coconut oil into our diet. I try to eat at least a couple of tablespoons a day for the health benefits. We eat a lot of fat in general, so I may just be used to the oily feeling, but these don't taste oily to me--at least not in an unpleasant way. I'd describe them more like melted berry ice cream. If you use refined coconut oil, then in my experience the berry flavor really does shine through, despite the fact that there's twice as much oil as berries in the recipe. Your berries to have to be flavorful to begin with, though, as I've tried this recipe with some other, more mild-tasting fruits and not enjoyed similar success. Can't wait to try making these - thanks for sharing. I was under the impression that it wasn't so good to eat refined coconut oil. But I notice you specify to use refined for this recipe. Is there a reason? If you look at the post again, you'll see that I use refined coconut oil because I don't care for the strong taste of virgin coconut oil when not countered with an equally strong flavor like chocolate. Refined coconut oil does not have all of the extra benefits that virgin possesses, but it is still very good for you. Just make sure to look for a good brand of refined coconut oil. Some of them are hydrogenated or produced with chemicals, which of course you want to avoid. Thanks so much for this. I just read about the benefits of coconut oil and had my first straight up spoonful this morning. I was not looking forward to finishing the jar in the same matter. Will definately be trying this tastier method tomorrow. I think Costco has just issued a recall on the antioxidant blend. So be sure to check the status of that before you buy or use any of those you have. As I said in the post, keep them in a container in your freezer. Finally got around to making these tonight. Definitely an oily taste but as you said, you're trying to eat more coconut oil. I used frozen blueberries & strawberries and partially thawed them. The mixture came out very creamy & tasted good before freezing them. Looking forward to trying them frozen later tonight or tomorrow. Thanks for the recipe! Just made these for the second time - first was ok but this time I don't know whether I'll be able to stop eating them - YUM ! Didn't have any vanilla so used 2-3 drops rose oil and a pinch of sea salt, which brings out the flavour. Got to go get another one. Nice! Thanks for sharing your variation. I'm having issues with these and the chocolate mint ones... when I freeze them the oil separates to the top. The choc mint ones kinda look like Andes mints and they're still very yummy. But I made these ones with just blueberries and they don't taste or look that great. Any ideas on what I'm doing wrong?? These ones taste like a mouthful of hard coconut oil... I'm sure I"m doing something wrong here... Thanks! (Tried to post earlier but it's not here now)... I have some problems making these and the chocolate mint ones. The oil separates once frozen. The choc mint ones like a little like Andes mints and they taste delicious. But these ones I tried just using frozen blueberries and they did not turn out. I'm sure I'm doing something wrong here. But they taste like chewing on frozen coconut oil... :/ I''m now using them in smoothies because no one will eat plain. Is it because I just did one fruit? Any tips for the separating? Blending it longer? Letting it sit? They sound so delicious I just know I'm doing something wrong... THanks!! Thank you for this post! It's exactly what I was looking for--a recipe that I could take on the road when traveling that didn't use chocolate, which I love but don't want to start my day with it. I will make this for an upcoming roadtrip. Blessings to you. Thanks. This recipe looks delicious AND it fits the paleo autoimmune protocol. So, thank you! I recently started a weekly Paleo AIP Recipe Roundtable through my blog, and I would love it if you linked up this recipe. I’m trying to expand resources for the AIP community. These look great! I can't wait to try them. Your molds don't look too big, more or less how many will this recipe make? Looks amazing! All my coconut oil sweet recipes are chocolates and I was looking for something new to give my clients, THANKS! I have tried stevie and am not as fond of the flavor as agave nectar. Would that be a reasonable alternative? Hi Kelsey, Ah, I'm sorry that happened! That sounds terrible. I've made this recipe several times and never had that happen, but I'm sure it depends on how cold your fruit is going in (since some freezers are colder than others). I'll add a note to the recipe. Thanks for sharing your experience. I hope they turned out all right in the end. Could I use fresh squeezed lemons for this ? And just the coconut oil ? Hi Meghan! I just made these this afternoon and omg they're amazing! I was wondering if you had figured any nutritional value for them? I can figure it for the entire batch but was curious for individual value. Thanks a bunch for this amazing recipe! Can't wait to try your others! Happy Easter! No, I haven't calculated that. It really depends on what size your molds are, how fully you make them, etc. I'm so glad you liked them! Fantastic recipe. iI keep coming back to it, have to say something. I'm a huge fan of coconut oil, in fact of the coconut in general as a source of quality fats and sugars when unrefined, unprocessed, and organic. Yes, its high in cholesterol, but it increases HDL cholesterol, helps control blood sugar, and is a vital source of 'anti-stress' antioxidants - even more so when I added a little bit of melted cacao nubs into this amazing recipe! how many does this make in one batch? This is just perfect, I think this will help me consume more coconut oil, thanks for sharing this useful information. I just made these with frozen mangos. My food processor is not working so I tried mixing in the blender and even though my fruit had sat out to thaw for an hour, the mixture did seize up and was hard to get out. But... the final product was so worth it! Delicious! Like mango ice cream bites. I was surprised it didn't taste oily at all to me. I used a little more mango since it's a milder tasting fruit - about 2/3 C. to about 3/4 C. of coconut oil, and added 1/8-1/4 tsp honey. (I don't like things super sweet and these were very sweet for me.) Such a perfect little treat! Thanks for sharing the recipe!